One question I have been asked many times back in 1984 and today by non-afficianadoes of heavy metal is: Don’t you get tired of listening to the same sound all the time? My answer is no. The stereotype on metal is that they all play the same four chords over and over. That might be true with some bands but at least every band chooses four different chords to play. That is what makes their sound unique. Plus, it also has a lot to do with the singer and lead guitarist as well. 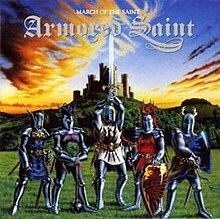 I was asked this question when I was listening to some Armoured Saint back in 84 and their debut album, “March of the Saint” proved my point. They were pure metal but at the same time, sounded unique. Most people who have experienced Armoured Saint know of the title track to this album. It has become their trademark song pretty much and I was exceedingly glad when they played it at Bloodstock in 2015. Boy, how time flies. If one song were to be used to introduce anyone to Armoured Saint, it would be that one. A great song to bring in the album and a great song to hear live. Of course, everything they played live on that day sounded great. 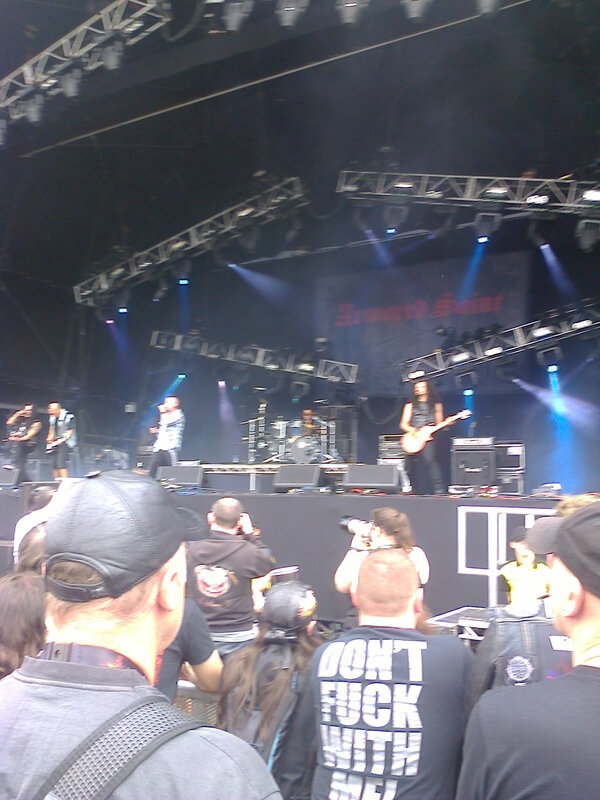 Armoured Saint establishing their dominance at Bloodstock, 2015. 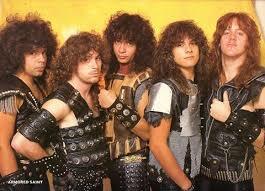 Since “March of the Saint,” the band have said that they were totally disappointed with the final mix of the album because it was too commercial for the more heavy metal sound the band wanted it. They would make up for that for sure in future albums. Still, I have always enjoyed this album and will continue to do so. Next post: Another band I who impressed the hell out of me at Bloodstock 2013, Black Emerald, will be having their album launch party for their debut: “Hell Can’t Handle All of Us” in Reading, UK this Saturday. I’m on their ‘Special Guest’ list to which I am truly honoured! See, a note to fellow bloggers, say great things about a band and you get invited to album launch parties. Although everything I have said about Black Emerald is certainly true. Don’t worry, next post, you will all get a full account of the evening with plenty of photos. This entry was posted on February 7, 2018 at 5:30 pm and is filed under 1980s, Concerts, Heavy Metal, Heavy Metal and the 1980s, Music, Rock, Uncategorized with tags Americans, Armoured Saint, Black Emerald, Bloodstock, Classic Rock, hard rock, Heavy Metal, Heavy Rock, March of the Saint, The 1980s. You can follow any responses to this entry through the RSS 2.0 feed. You can leave a response, or trackback from your own site. YES!! That’s how all bands should dress! Oh definitely! I’ll mention it to Black Emerald this Saturday.